Oh boy, awkward, I recall Dynamite was having legal problems due to the rights of Tarzan. But I heard that they have the Zorro license, so I hope you can still get royalties outta them Don. That way I won’t feel so bad about buying them since I love the character and have been waiting forever for news like this to come along. 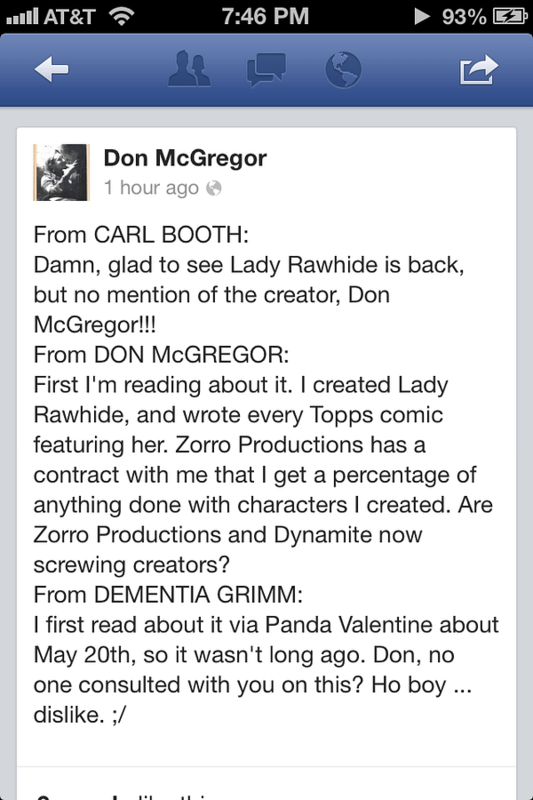 I would not have written the Zorro series without creating Lady Rawhide. As Jim Salicrup can tell you I could not commit to a monthly book that that did not have any women in the series. I did not do Lady Rawhide in the newspaper strip, and created Eulalia Bandini, because Lady Rawhide’s character was such a source of contention with some people at Zorro Productions until she became so popular. I fought hard for her character through-out the series. There’s only one person who knows the ending to LADY RAWHIDE: OTHER PEOPLE’S BLOOD. And that’s me. If someone were to do it, it would be like the PANTHER VS. THE KLAN. They have no clue what I intended to do. Wow. Does it ever stop? Apparently not. Not even when you meet personally with the head of Zorro Productions and have it put in writing. I was weary of creating characters and then people who could not create would see ALL the money derived from them. Marvel wanted me to come back, at the time I was just starting to research Zorro, and create an alien world for Professor X. I preferred working with Jim Salicrup, and was so invested by that time in creating Lady Rawhide, Machete, Moonstalker, Star Wolf, Scarlet Fever and the others that I didn’t have time to even do a series for Milestone. I had a strong story that I told Dwayne McDuffie when he approached me, and he never flinched. But I never would have been able to keep his deadline, especially when Zorro Vs. Dracula came along. And that’s a book I won’t be buying, for sure. Thank you, Lou. My Mom’s name is Louise. and two missing Dailies, as well. Thank you, Michael. They steal a writer’s blood and soul. LADY RAWHIDE would not act in a cowardly fashion. And she would honor her word. There was no DETECTIVES INC.
to worry for the rest of her life. I live with these characters. When I write a monthly book, I’m committed to it, and the people who work with me know it. If you want easy; I don’t do easy. I love comics too much, and care to give everything I’ve got to the readers. And if I fail, then it’s honest failure. I’m running around the city in meetings. Funny coincidence – Last night I had a meeting with two comics creators, and the interesting thing about when they talk about royalties. They get them after the book ships and after the end of the reporting period. You know, the way the world works. They don’t seem to get paid based on an announcement. Now, a book gets announced and Don is already being screwed out of any financial compensation that he has an agreement on? I doubt it. I’ve worked with the Zorro Property Owners for 4 years, and they always honor not only their contracts, but their word. I’m not speaking for them, but saying what in my experience and what I can comfortably say for the experience that I’ve had with Matt Wagner and others. Don talks about “honest failure” to the audience. I guess it’s ok if he lets them down. I have a lot of respect for Don. But this was unfair to Zorro Properties to go out there and make these claims without asking anyone what the release schedule was, the book ships, etc. It would have been nice if Don would have been professional and asked honest questions before making wild assertions. And then complain if he’s not happy. Which he is happy to do. It would probably have been nice is Don was informed about what was happening by Dynamite or Zorro Productions. But, if nothing else, it does appear that he will get paid. And maybe this could be the start of a beautiful friendship.